Play music wirelessly from your phone or other bluetooth devices on your home /car stereo system or when driving with this Bluetooth audio receiver. Enjoy the high-quality audio streaming from your phone or other Bluetooth audio transmitter in CD-quality sound through your speaker. Freedom to move freely in your house or your car as you listen - conveniently control and stream music from up to 30 feet/10 meters away. 3.5mm audio interface, connect AUX directly Easy to install - simply plug it into your stereo, then connect to your device with just one press of a button. Easy operation: You can answer phone calls or control music on the receiver. Change volume, play/pause music, answer/drop calls, redial the last called number with ease. This receiver doesn't turn on automatically,please long press the MF button about 3 seconds,the blue LED light flashes per 5 seconds when it's connected successfully. 【Advanced Bluetooth 4.2 Technology】 Super faster pairing your bluetooth devices；Get higher quality audio sound than Bluetooth V4.0/V3.0, for playing music and answering calls；Bluetooth range reaches up to 40 feet in open space without obstacles. 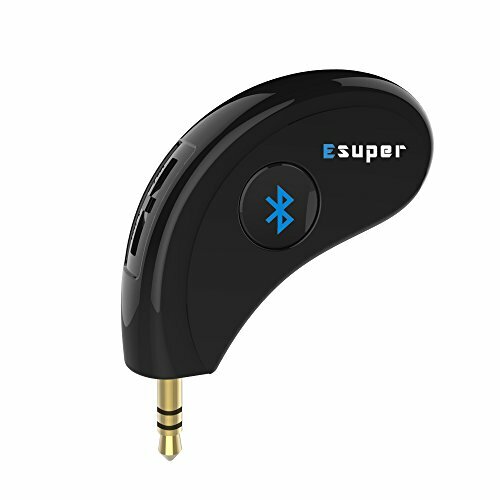 【Wide Compatibility】 Esuper bluetooth receiver is ideal for turning wired stereos and headphones into a Bluetooth-equipped system to receive signals from most audio output devices like Android Smartphone's, Apple iPhone ,Blackberry,HTC,LG,SONY,Tablets, MP3 Players & More,Please do not to pair it with Bluetooth speakers / headphones. 【Super Long Working Time】 Just charged this wireless car aux adapter within 2 hours,then it can be fully charged,then you enjoy above to 6 hours nonstop music streaming, radio or phone calls and 300 hours standby time. 【Ergonomic Design】 Esuper bluetooth aux adapter is designed with an emphasis on ergonomics,according to our hands using habit,designed by the smooth and beautiful body line,easily plug in and pull out.Meantime, the compact and lightweight build to easily tuck away and take on your travel,directly plugs into the AUX port on your in- car sound system while keeping a low profile. 【Stream Wirelessly】 Breathe new life into older speakers, headphones, or car stereos by turning them into Bluetooth 4.2-enabled devices;enjoy your music freely. One-year warranty and lifetime support provided by Esuper. If you have any questions about this product by Esuper, contact us by completing and submitting the form below. If you are looking for a specif part number, please include it with your message.